Bobby Clark as the Gorn commander and William Shatner as Capt. Kirk mix it up at Vasquez Rocks. Episode One of the original “Star Trek” series – “The Man Trap” – debuted Sept. 8, 1966. Click on the control panel at lower right and you’re transported to a depiction of Vasquez Rocks in Agua Dulce – a favorite filming location both for the original “Star Trek” series (1966-69) and for later “Star Trek” series and feature films. A figure resembling a green PEZ dispenser enters the animated image of Vasquez Rocks. That’s the Gorn commander, a lizard-like alien that Capt. Kirk (William Shatner) fought in Episode 19, “Arena,” released Jan. 19, 1967. The Vasquez Rocks sequences were shot over two days in November 1966. The Gorn commander was played by Bobby Clark, a character actor who worked mostly in Westerns. Living in the San Fernando Valley at the time, he moved to Saugus in 1969 and still lives there. 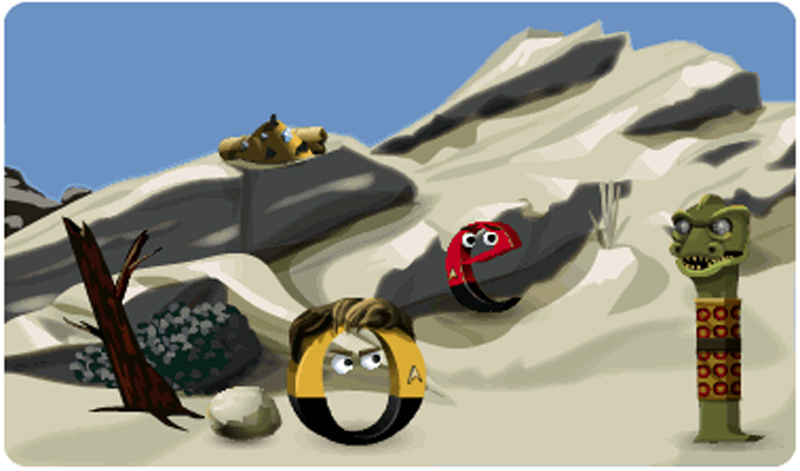 Click the rest of the way through the Doodle; Kirk bonks the Gorn character on the head and then blasts him with a bamboo cannon, as in the episode shot at Vasquez Rocks. As the animation ends, the viewer is “transported” to a Google page where the top news story, from WebProNews, shows the actual clip from “Arena” where Kirk (Shatner) defeats the Gorn commander (Clark). On Aug. 4, Clark returned to Vasquez Rocks for a reenactment – without Shatner – for an upcoming episode in the SCVTV series, “SCV In the Movies.” Local film historian and series co-host E.J. Stephens produced the segment; playing the role of the yellow-suited Kirk was Stephens’ co-host Bill West. Watch the original version of Kirk (Shatner) defeating the Gorn commander (Clark) below. Note: Clark did not provide the “grunting.” The Gorn’s audio was added later by a sound engineer. Actor Bobby Clark at Vasquez Rocks on Aug. 4, 2012, for an “SCV In the Movies” episode on SCVTV (not yet released).